When a yakuza gang top honcho died, Takayama was selected to replace him. He would then have to select a replacement for his previous executive position. So he sends 5 of his best ward bosses to an old folks' home to be helpers (hiding their yakuza identity - literally too, they have to cover up their extensive body tattoos - as the home is in another gang's territory). their discovery of the purpose and their performance during the mission will determine who gets the executive spot. As they learn to do the job of helpers, they also deal with issues of the old folks, apply the code of the yakuza in their mission and handle their own issues. so at the end of the mission, who got promoted? that's for you to watch and find out! how i derived that score. edutainment at its best. you learn about old folks issues, code of the yakuza, and the cash cow that is the retirement homes for old people who have been put out to pasture. 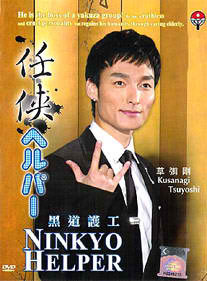 and damn if Tsuyoshi isnt the coolest baddie ever. he practically chain smokes and fights like a demon. learn about operations of retirement homes, the difficulties of a sole caregiver, the evil that prey on the weak old folks, and gang fights!